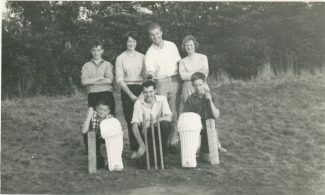 A German couple learning the joys of cricket on the field where Mayflower School now stands. Back row: Alan Jones, the German couple, Renee Wright (the German's host). Front Row: Graham Jones, Peter Bennett and myself. This masterclass is on the fields where Mayflower School now stands. During, or shortly after the second world war, my parents bought a plot in Norsey Road , thus joining a trend to move east out of the suburbs of London , in their case from Leytonstone and Chingford. Unfortunately the need to repair war-damaged properties and a lack of building supplies meant it was to be several years before they were allowed to build and even then materials were limited. The result was a two bedroom bungalow designed by an architect with the name of Strong living in the road. “Brambles,” later to become number 184, backed on to Norsey Woods and fronted Norsey Farm. It was where I was to live for twenty formative years. I can remember very little of my pre-school years, but at 5 years old I started at Billericay Junior School in Laindon Road (now Quilters) and stayed there until I was eleven (1954 -1960). I cannot recall the head teacher’s name , but several others names come to mind …..Miss Watson was my first teacher and possibly we were her first class as she was noticeably younger than her colleagues. There were two Mr Williams, Ray and Tom…….. one of whom was I believe deputy head , a Mr Reeder, a Mr Doyland, Mrs Arthy, Mrs Butler and Mrs Gay. It certainly illustrates the current argument about the present lack of male teachers to act as role models in primary schools. We were divided into houses named after the Pilgrim Fathers of Mayflower fame ……Martin, Langham, Browne and Prower if memory serves. There was a system of merit/de-merit marks totalled on a weekly basis, which engendered a competitive spirit, but I cannot for the life of me remember the reward system. Out in the playground the boys mainly indulged in physical activities …..chasing one another, playing tag, which in one instance led me to collide with the school railings and kicking a ball about. Non-physical activities included playing cigarette cards by flicking one’s card up against a wall . The nearest to the wall was the winner and kept the loser’s card. The older cards were thicker and consistently out-performed the modern flimsy equivalent. By then cigarette cards no longer came with packets of cigarettes, but with packets of tea. Marbles were also won and lost, though the means were more akin to bowls. Another popular game I remember was fives/jacks. Girls skipped a lot…. More formal activities included a regular visit to an indoor swimming pool in Hutton, which I believe was owned by one of the London boroughs and was not available for public use . Outside of school the nearest indoor pool was in Hornchurch and the nearest outdoor one was in the Ongar Road , Brentwood . Football was the main sport and life-long team allegiances were formed, which because I chose a team (Wolves) doing well at the time , has meant years of subsequent disappointment. In my final year I was the school goalkeeper and a match against a Wickford team saw us lose 10-1. Shortly afterwards I attended my first optician’s appointment and came away with a prescription for glasses. It may have been a coincidence, but I fancy it had something to do with the score-line! Particular friends at school included Tony Smith, Trevor Whitaker and Graham Jones and of the girls I remember Ann Randall, Linda Cheeseman and Miriam Bex. Sadly I lost touch shortly after we went our separate ways at 11. I can only remember two instances where the outside world impinged on our little world and caused general excitement. Firstly the launch of the Sputnik satellites into space, which suggested that Dan Dare‘s exploits in the Eagle comic were no longer just fantasy. Secondly the escape of Alfred Hinds from Chelmsford prison. Alfred was a serial escaper and a thorn in the side of the establishment. On occasion he was apt to take on the police in the courts and win, thus attaining a certain celebrity status. We joined in the hue and cry by labelling every passing stranger as Alfred. Of the teaching we received , the most memorable came with Mrs Butler in our last year, when she introduced us to another language…German and to the stories of Eric Kastner. In particular the adventures of a boy detective, Emil. I remember very little of the plots, but one character, because of his funny name, sticks in my mind …..Herr Tischbein (Mr Table-leg!). Outside school organised activities included cubs and Sunday school . The former was with the Second Billericay pack, led if I remember correctly by Mr Reeder, the school teacher, who was obviously a glutton for punishment ! I was aware of the Third Billericay but the First eludes me. On the way home, if we had four pence, it was a bag of chips at Goodspeed’s and if we were feeling brave a game of knock-down ginger. Bob-a- job week was a highly competitive affair and we would trawl the local roads for small tasks…..weeding being the worst. It is a sad reflection that nowadays parents would shrink from allowing children to knock on stranger’s doors. My only memory of Sunday school, which took place in Chapel Street , is of a coach outing to Maldon. Graham Jones was my nearest friend and our playground extended beyond our respective gardens to Norsey Woods ( then private property ) and the fields behind Graham’s bungalow (now part of the Mayflower school). Our parents did not own cars so contact during school holidays with other school friends was limited. Typically we would play commandos, build dens, go tree climbing, play football. We would sometimes go treasure hunting as stuff got dumped in the woods and a series of trenches with barbed wire and fragments of sand bag material suggested that some military training had taken place there. Our heroes were Davy Crockett, Robin Hood and William Tell. Our tree of choice for making bows and arrows was hazel as yew trees were few and far between. We ranged far and wide , but we always kept an eye on the sky, which especially in the summer holidays would often turn almost purple …heralding a fierce storm. Lacking local racoons my brother obtained a fox tail for me from the local hunt. An essential ingredient in making a Crockett-style hat and this was not the only politically incorrect activity we indulged in. We picked bluebells in their thousands to sell to our neighbours, but as gardeners will know they wilt very quickly, so this was never a practical or profitable occupation. However placing them on a wood ant’s nest and watching them turn pink was very satisfying. Furthermore we collected bird eggs . In our defence we only took one per nest and as to the bluebells we always left the bulb. However we did try to encourage red squirrels by planting a hazel tree, which proved successful for a short while. The same hazel was later to provide a nesting site for a family of flycatchers over many years. Strangely enough I now live in a far more built-up area, but see a greater variety of wildlife than in the semi-rural Billericay. To see a fox or badger was a rare event…not now. Likewise the magpie, once a rural sight, has now moved into the suburbs. The exceptions to this were swallows which came in great numbers and sparrows likewise. I suspect that the farm with its crops and pond were the attraction. The swallows when they came to fly off in the autumn gathered on the telegraph lines, resembling musical notes (crochets / quavers ?). Things change over time and another example is that clothing particularly seemed to become more colourful in the 1960s. In the 50s grey or khaki seemed the order of the day. Likewise food has become more exciting with the international approach offering a huge variety of food products to choose from. Another memory is that houses were so cold in winter – no such thing as central heating. Ice on the inside of the windows not being uncommon. With Crittall windows and a single fireplace it was a case of shutting the door and huddling around a fire whose heat went mostly up the chimney. Alas central heating never came to 184, for by the time it became affordable, there was a regulation that prohibited connection to the gas supply if you were a certain distance from the road. It was often Dad who shopped on a Saturday and the last port of call was the sweet shop near the Chequers, where I regularly spent my pocket money on a coconut square. Another shop which became increasingly dear to my heart was Harrington’s the ironmongers, which sold all manner of goodies……. Fishing tackle and licence, cap guns and caps, catapults, spud guns, Airfix kits …. you name it, Harrington’s stocked it. As for our neighbours, I can remember some of them ….On the opposite side heading away from town there were the Leas, who had a daughter, Angela and a small- holding; The Wrights with two daughters, Heather and Rae and two poodles; the Jones’s with my friends Graham and Alan. Mrs Harding with stepson Peter Bennett, two (?) daughters and numerous cats. I later became aware that Peter had become a leading authority on lichens; Mrs Andrews occupied the first of the Jubilee Cottages and sadly lost her sight, Mr King, who drove a dustcart for Basildon Council and kept chickens and the Randalls, who’s daughter Ann went to school with me. Sadly both Mrs Randall and Mrs Jones died young. I suspect cancer of some sort, but it was never talked of in those days. The last I heard of Ann was that she and her partner were buying up antiques and shipping them to the USA . Moving to the next group of three cottages, whose name I can’t recall, the far one from the town was occupied by Mrs Attridge and her two sons Michael and Raymond; One of the other cottages was occupied by Mrs Dennington who worked on Norsey Farm and could often be seen accompanying the farmer (Mr King ?) on a horse and cart as they headed for town selling their vegetables along the way. My brother and I were often deputed to buy potatoes from this farm and occasionally my parents would complain to the farmer that much of the weight was because he failed to knock the soil off. He was a farmer not well disposed to children venturing into his farmyard to visit the horses. On our side of the road from the Ramsden end there were the Quirks with 3 sons …Roger, Douglas and Howard and two Alsatians…Rex and Duke; The Brandis’s with one daughter, Jean , ourselves , The Hughes family with two children (Brian and Angela), the Kings with a son, Melvyn, the Strongs with one son Peter , the Walters with two sons, one of whom later flew Tornados in the RAF , Finally the Maltons with one son, Tony. Looking at this list of folk remembered, it is clear that the vast majority had children of a roughly similar age and the childless did not impinge on us in the same way. Mrs Harding and Stan Harding were my grand parents. My Nan had four daughters and two sons. Peter Bennett Is my father. My nan would of been 100 years old this year. She was an amazing person. She started the cats protection league which is still going strong today. I spent many good times visiting my grandparents bungalow down Norsey Road and distinctively remember spending a lot of time in the back garden with my brother Paul and my cousin David Moore. Trevor Whitaker, his sister Jill and family later moved to a house on the corner of Maple Mead, Billericay. Like you, in the late 50s and early 60s, I and my friends would leave the Ritz cinema to go down to Goodspeeds to buy our bag of chips before running the length of Chapel Street playing knock down ginger. Those people must have got fed up!! We too spent our school holidays collecting bird eggs , primroses and bluebells from both Norsey and Frith Woods. We built dens in Mill Meadows, rafts on the ponds at Laindon Common and cycled miles. We loved to go to Coxes Farm Road to see the animals of the Rosaire Circus family and to go pond dipping. Or to Barleylands to see Mr King’s lioness and beautiful horse. Graham Jones is wrongly labelled as Graham Wright in the photo. I worked with Stan Harding (Plumber) in the early sixties. One of the daughters was named Margaret but cannot remember the other. Melvyn King worked as a butcher in Ramsden Heath.